Bangkok-based Backyard Travel is offering a new trek in Vietnam’s Phong Nha-Ke Bang National Park, an untouched area on the country’s on north central coast. The six-day, five-night tour begins and ends in Dong Hoi, the capital of the Quang Binh Province which lies about 285 miles south of Hanoi. 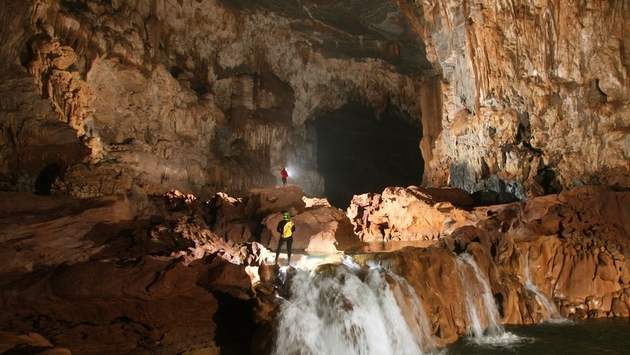 The trek itself begins in the town of Phong Nha. The 2.5 mile journey through the National Park stops along the way at Tang Ham Co (nicknamed ‘Eight-lady Cave’) before moving onto Paradise Cave (Hang Tien Duong). The 18-mile long Paradise Cave is one of the largest caves currently open to visitors in Vietnam and features breathtaking stalactites and stalagmites that can be viewed from a safe wooden walkway. The journey then visits Nuoc Mooc Springs and the 4.8 mile long Phong Nha Cave which has an underground river running beneath it. The river’s path through the cave can be navigated by kayak and travelers can paddle their way through the cave which also features several ‘grottoes’ which can be explored on foot. Other caves that the trek explores include the ‘dry’ cave Hung Chout, Hung Ton Cave and Hung Ton Cave which can only be reached by a 100-metre swim. After navigating the Tu Lan Valley, trekkers will also have the chance to investigate the Hang Ken and Hang Kim ‘wet’ caves before visiting Tu Lan Cave where they can discover the rare ‘cave pearl’ sand formations. While trekking through the park, travelers will sleep in tents or hammocks, or experience the community lifestyle of a rural village. Australia’s Great Southern Touring Route is one of the world’s great drives encompassing the Great Ocean Road, the Grampians and Ballarat, all highlights of the state of Victoria. The Great Ocean Road hugs the southwest coast of the state, passing through some of the most dramatic scenery in Australia, including the Twelve Apostles and Shipwreck Coast. More than 400 million years of geologic history appears in the Grampians as well as some of the country’s finest Aboriginal rock art. Ballarat is the gateway to the Goldfields region. The city's classic colonial architecture stretches out along broad, tree-lined streets reflecting the riches taken from the ground after gold was discovered in the 19th Century. It all begins in Melbourne with a rental car. 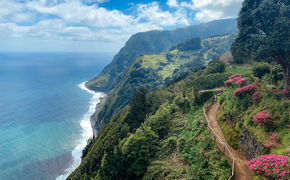 Down Under Answers is offering the six-day/five-night self-drive Melbourne, Great Ocean Road, Grampians, Ballarat & Spa Country from $1,195 per person double. The package includes a six day intermediate car rental; a night at the Wyndham Resort Torquay; a night at Hearns Cottage Suites, Port Fairy; a night at the Royal Mail Hotel, Dunkeld; a night at Ballarat Lodge; a night in the Lake House, Daylesford; the Otway Fly Treetop Walk and entrance to Ballarat Wildlife Park. The 42nd Hong Kong Arts Festival runs from Feb. 18 to March 22 at venues across the island and wider territory. Germany’s Gürzenich Orchestra Cologne open the festival with Mozart’s Clarinet Concerto, featuring clarinet virtuoso Sabine Meyer. Other highlights include a fully staged production of Richard Wagner’s Lohengrin. The Bristol Old Vic from Britain will present the Asian debut of their collaboration with the Handspring Puppet Company of A Midsummer Night’s Dream. Also premiering in Asia is the Scottish Ballet’s Highland Fling in which Olivier Award winner Matthew Bourne choreographs an upbeat, dynamic and thrilling reworking of the classic La Sylphide. Besides performances from world class artists, the festival’s “Plus Programs” will have activities aimed at encouraging interaction between artists and the audience. This includes free master classes, backstage visits, workshops, exhibitions and film screenings at performance and community venues.